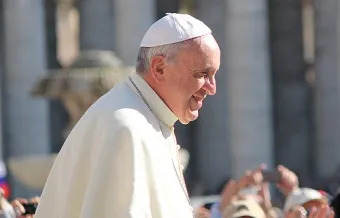 During his Angelus address Sunday Pope Francis reflected on the Gospel account of Saint Peter's recognition of Jesus as the Lord, urging those present to honestly evaluate their own faith. “Brothers and sisters, what happened in a unique way in Saint Peter, also takes place in every Christian who develops a sincere faith in Jesus the Christ,” he told crowds gathered in St. Peter's Square on Aug. 24. Pope Francis reflected on how in that exchange with Peter in the Bible, Christ bestows a new name on him since he was formerly called Simon. The pontiff invited those present to pause and consider how the name Peter meant “rock” in Jesus' language of Aramaic. Pope Francis noted that Jesus' Church is fundamentally based on our relationship with him, which should be one of love and trust. As Christian persecution is becoming a norm in our society, it is good to see Fr Robert Barron starting to provide some thoughts about it (see video below). After watching the video and reading many of the comments for this video, something came to mind about our original Father's in our faith; many were martyred and they looked forward to being a martyr. With all the persecutions taking place in so many countries and the media covering it all in great detail I sense and feel how fear is being implanted into everyone's heart. That fear can easily be channeled into flight or fight ideas.